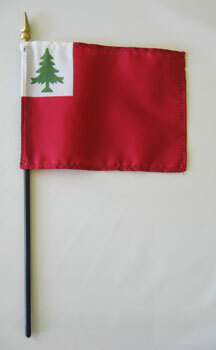 Our 4" x 6" Continental stick flags are made from a high quality, silk-like polyester fabric. They feature a hemmed flag mounted on a black plastic 10 inch staff with a gilded spear point. These versatile stick flags can be used on tabletops and desks, to wave in parades, or to decorate flower arrangements. Colonel John Trumbull's painting, "The Death of Warren," shows the red Continental Flag to be the one used by American forces at the Battle of Bunker Hill, June 17, 1775.